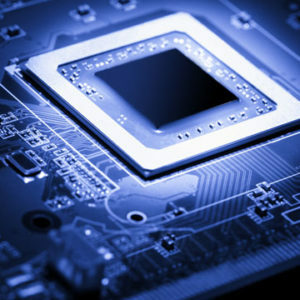 The semiconductor sector is on the rise again. You know the sector favorites like Nvidia and Advanced Micro Devices. 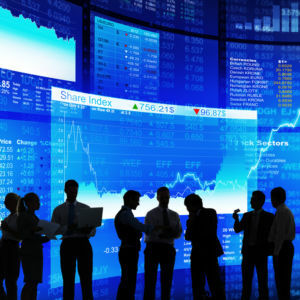 But today we’re talking about another chipmaker making a splash, Micron Technology, Inc. (NASDAQ: MU). Micron is an American chipmaker based in Boise, Idaho. The company produces many forms of semiconductor devices, including dynamic random-access memory, flash memory, and solid-state drives. Micron has stayed off most folks radar the past year. Incredibly however, Micron shares are up 131% year-over-year, as reported by Investor’s Business Daily. And they did this without creating the slightest media buzz. As it turns out, Micron is one of the companies leading the way for the recent resurgence in semis. For the past 30-days the stock’s up over 11%. Here’s the chart. And as we write today, the stock is up 4.44% at $55.76. The company’s run is due to two specific factors. 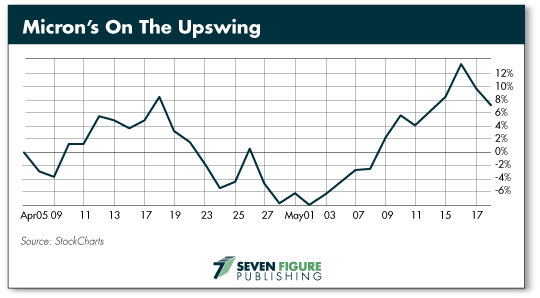 For one thing the entire sector is on the upswing, buoyed by continued high demand for semiconductors in general. 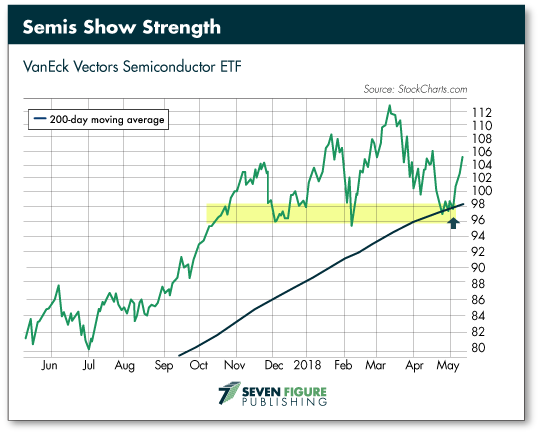 Our own investment expert Greg Guenthner noted last week the VanEck Vectors Semiconductor ETF (NYSE:SMH), was in “picture-perfect bounce back” mode. In the wake of the sector’s rise, Micron adjusted its next quarter’s guidance significantly. Today Micron announced they now “expect sales for the quarter to be in the range of $7.7 billion to $7.8 billion versus its previous guidance of $7.2 billion to $7.6 billion. 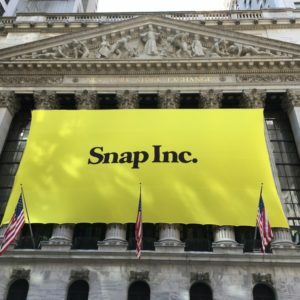 It also forecasts earnings per share of $3.12 to $3.16 compared with the prior target of $2.76 to $2.90 for the quarter,” according to Barron’s. Shortly after the announcement, Micron shares went flying. And according to many experts, Micron’s run is sustainable. And given the need for advanced chips and memory systems we’re seeing across the board in tech, we would agree with this assessment. The second factor bolstering Micron shares is the easing trade tensions between the U.S. and China. Asia, and China specifically, are major markets for U.S. chipmakers. The news is a huge lift for the sector, and has helped power Micron’s big gains today. Yes, there are questions on whether trade tensions will remain subdued moving forward. But if they do, we can expect this to help power more gains for Micron. And if trade tensions rise again, the boom created by an ever increasing demand for chips should allow Micron to offset the impact. As of today the Micron stock is trading above its 50-day moving average, and currently trading a shade below its 365-day high of $60.58. Both positive signs for shares. If you’re looking for exposure to the rising tide in semis, Micron is worth taking a look at. Keep in mind this is not an official recommendation. Be sure to do your own research before making any moves. And never bet more money than you might be willing to lose. Wall Street is talking smack about Q4 earnings. But while doing so they’ve overlooked an important bullish breadth thrust. Two, in fact. Here’s why I expect 35% upside for one major index. 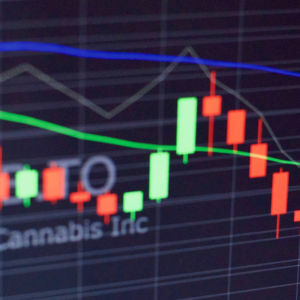 Today Ray recaps the pot market’s recent action. Then he takes a deep dive on a new pot IPO showing lots of promise. 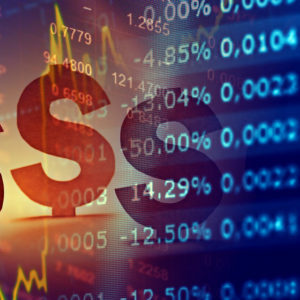 Are We Headed for a Recession or Not? The doom-and-gloomers are out in force warning of a pending recession. 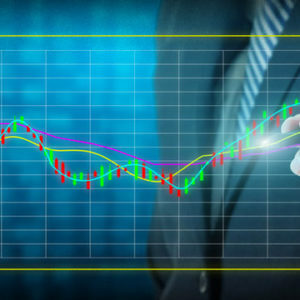 Today I assess the truth of these claims in Part 1 of my two-part 2019 market forecast. What happens when an ill-advised IPO gets whacked? 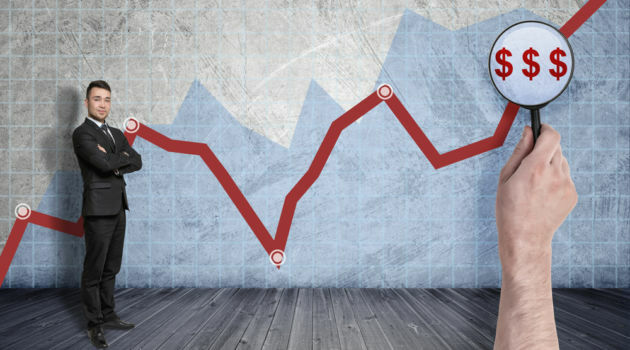 Today, Greg Guenthner shares the best and worst tech IPOs-- and one opportunity for quick profit.